A while back, looking for insight into theistic thinking, I read a book titled, “Life, God, and Other Small Topics: Conversations from Socrates in the City ” Edited by Eric Metaxas. This is a collection of speeches by eminent theists at a monthly function in New York City. The third chapter of the book consisted of a speech titled, “The Importance of Fatherhood,” by Dr. Paul Vitz, Professor of Psychology at New York University, and author of “Faith of the Fatherless; the Psychology of Atheism, “ and several other books. Dr. Vitz, as a professor of psychology, is supposedly a scientist, but his speech amounted to blatant emotionalism and a transparently shoddy attempt to pass off anecdote as science. Vitz’s approach was to list several famous atheist bad people such as Stalin, Pol Pot and others, and then briefly outline their life histories to demonstrate that they all lacked good fathers. You may notice that this is very similar to the Christian tactic of claiming that atheists are immoral because famous atheists like Stalin and Pol Pot were immoral. Vitz claims to get even more “knowledge” from these historical figures’ life stories. According to him, not only were these bad people atheists, but they became atheists, at least in part, because they had bad fathers. To show how this game is played, what if I were to state that religious leaders are pretentious, self-obsessed, dishonest charlatans (i.e. “bad people”), and provided brief histories of the following to make my case: Joseph Smith, David Koresh, Jim Jones, Jimmy Swaggart, Jerry Falwell, Warren Jeffs, Ted Haggard, and Jim Bakker? Would I have actually proved that religious leaders are bad people? Obviously not; at most I would have proven that some are, and my hypothesis may be worthy of further study. Vitz said, “You fathers are of great importance in forming the religious attitude of your children. As we have seen, many an atheist was damaged by negative personal relationships, especially with a father or father figure.” The implication is clear that we atheists are “damaged,” and, presumably, atheism itself is a symptom of psychological damage. Yet, I have read dozens of testimonials on ExChristian.net by people who have lived with chronic fears and anxiety, and/or seriously damaged self-esteem, which was clearly caused by strict fundamentalist upbringing. I could very easily collect a few stories of the type I describe, which mentioned fathers, and then write with 100% accuracy that “. . . many a THEIST was damaged by negative personal relationships, especially with a father or father figure.” See how easy it is to play the anecdote game? So, according to Vitz, good fathers raise theists, and bad or missing fathers raise atheists. But, even if this were true, how are we to know from his few stories whether this holds true for 90%, or 1%, or 0.001% of the population? Obviously, we can’t know from stories alone. So, what has he accomplished here except to suggest that his thesis is correct, when in fact, as he surely knows, he hasn’t proved a thing, and in fact may have grossly misled his audience? Good fathers raise theists, and bad or missing fathers raise atheists.And, when one makes blanket statements, he risks being proven wrong by the exceptions. Bill Gates and Warren Buffet are extremely wealthy atheists who have given billions of dollars to charities. Now, should we assume these atheists are bad people? (And that they had “bad” fathers?) And why didn’t Vitz profile these well-known atheists in his research? 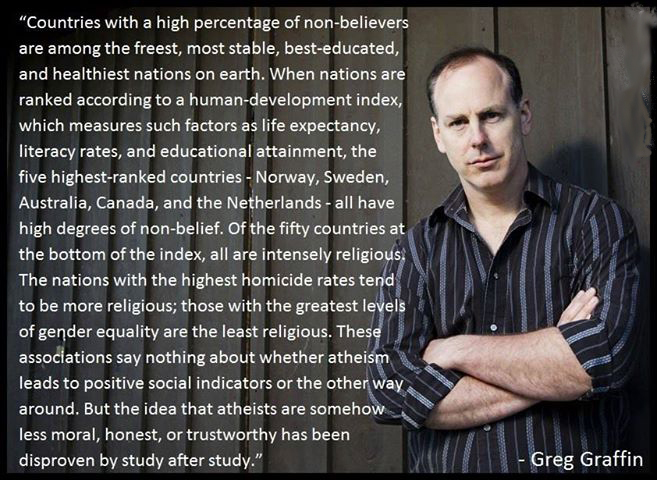 It is a simple fact every competent scientist knows that a pile of anecdotes, no matter how high, can never prove anything beyond the weakest scientific claim – such as, SOME religious leaders are dishonest, or SOME atheists had bad fathers, or some atheists were/are bad people. To portray a collection of anecdotes as hard won truth achieved through serious research is misleading at best and dishonest at worst. Anecdotes are stories. Now, stories may be useful for illustrative purposes, but they are not data. You can go into any Christian Science reading room and find thousands of stories about prayer healing people’s health and other problems, but we also know you won’t find any data there. Christians seem to have a problem understanding this, even some Christians who are scientists. Over and over Christians use stories they have heard or read, or stories from their own lives, and claim their stories prove their contention – that Bible-god exists, or prayer works, or atheists result from bad fathers, etc. We need to recognize when this trick is being used and call them on it. This is not science, and for any “confirming” story that one hears, a disconfirming story is almost always close at hand. Tell me a story of how prayer worked, and I’ll tell you a story of when prayer didn’t work. Tell me a story of how man’s conscience proves there’s a god, and I’ll tell you a story of how some men’s consciences convinced them they should fly airplanes into tall office buildings. Show me the data, Dr. Vitz, that bad fathers routinely create atheists, and maybe then I’ll take you half seriously – but only half, since you still will not have proven that being an atheist is a bad thing. But, a few stories shouldn’t convince anyone, and you, as a scientist, should be ashamed for using such a shamelessly misleading tactic. Maybe I should use your speech as “proof” that Christians are so brainwashed with self-righteousness than they can’t even recognize their own cheating? But, alas, you needn't worry; I value my self-respect far too much to play the “anecdote as proof” game.